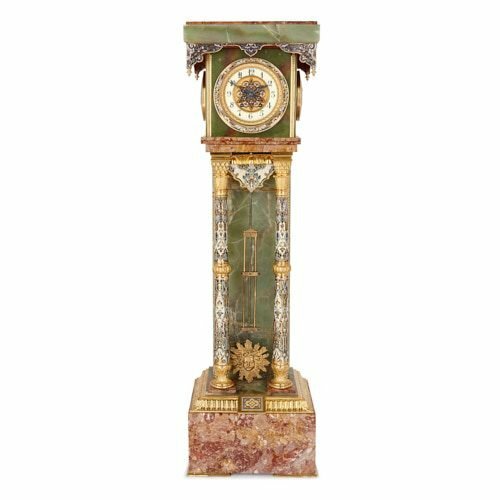 This clock has been exquisitely crafted from red marble and green onyx and decorated with colourful champlevé enamel and fine ormolu mounts. 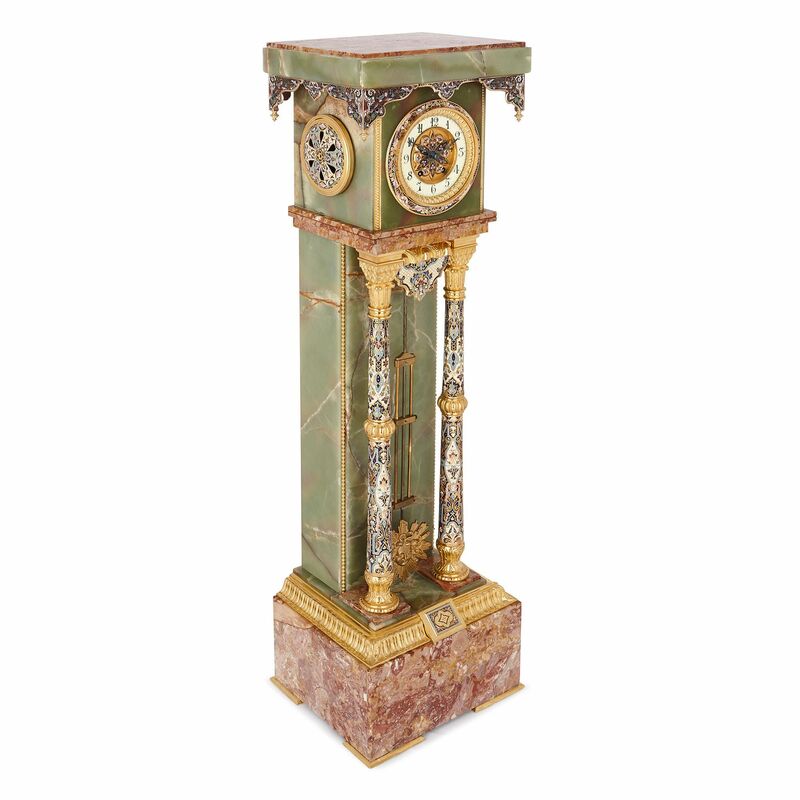 The clock is of pedestal form, and is set on a square, red marble base, which is veined and flecked with pink, white and orange colours. 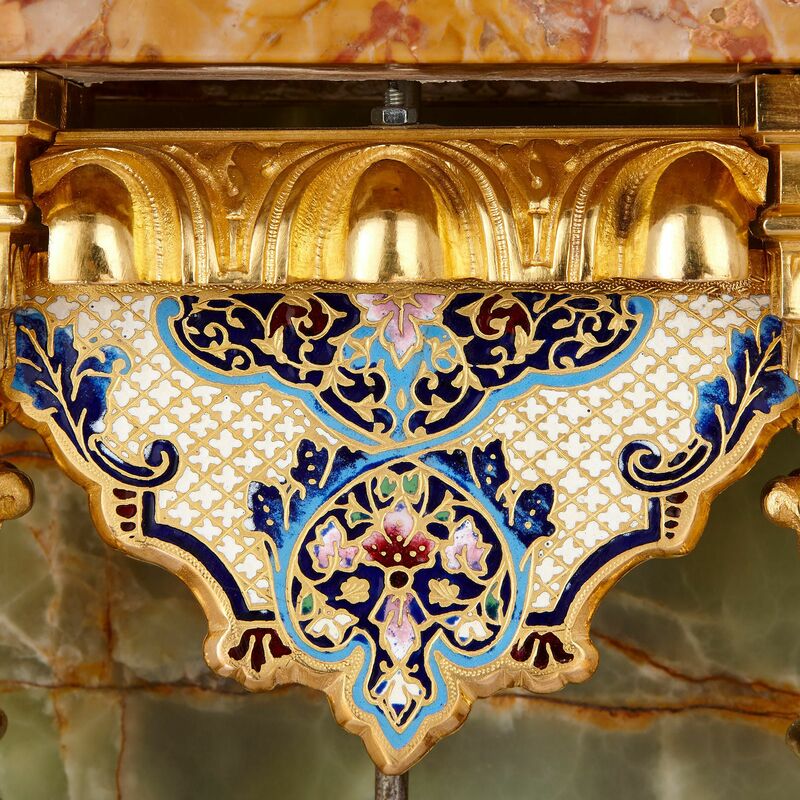 The upper edge of the marble block is edged with a fluted, ormolu band, which is mounted at its centre with a decorative champlevé enamel panel. A tall, rectangular green onyx block, edged with ormolu beading, stands on the marble block, with two columns positioned before it. The columns stand on slim, rectangular red marble plinths. They have decorative ormolu bases, champlevé enamel shafts, with ormolu egg-and-dart bands around their middle, and ormolu, stylised acanthus leaf capitals, topped by muqarnas, which is a feature of Islamic architecture. A shaped, champlevé enamel panel, with an ormolu egg-and-dart top edge, occupies the space between the two column capitals. The long clock pendulum extends down, behind this shaped panel, and terminates in an ormolu sun-burst motif near the column bases. The two columns support a red flecked marble architrave, upon which rests the cube-shaped green onyx clock case. A circular dial is mounted onto the centre of the front of the case. 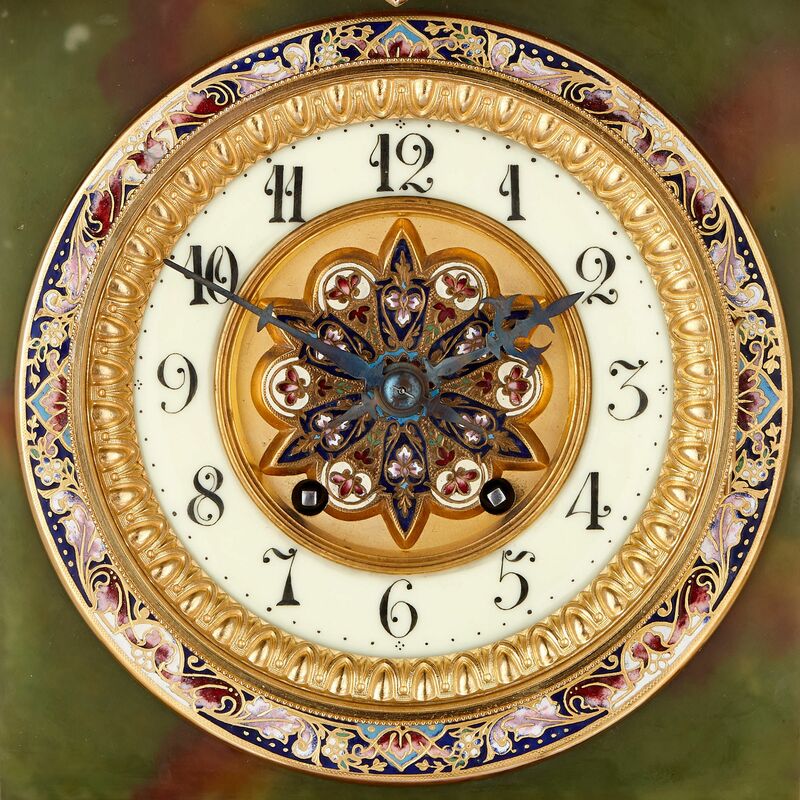 This features a decorative ormolu, champlevé and white enamel centre, ringed by a white enamel band with Arabic Numerals. This is framed by an egg-and-dart ormolu bezel, with a champlevé enamel border. 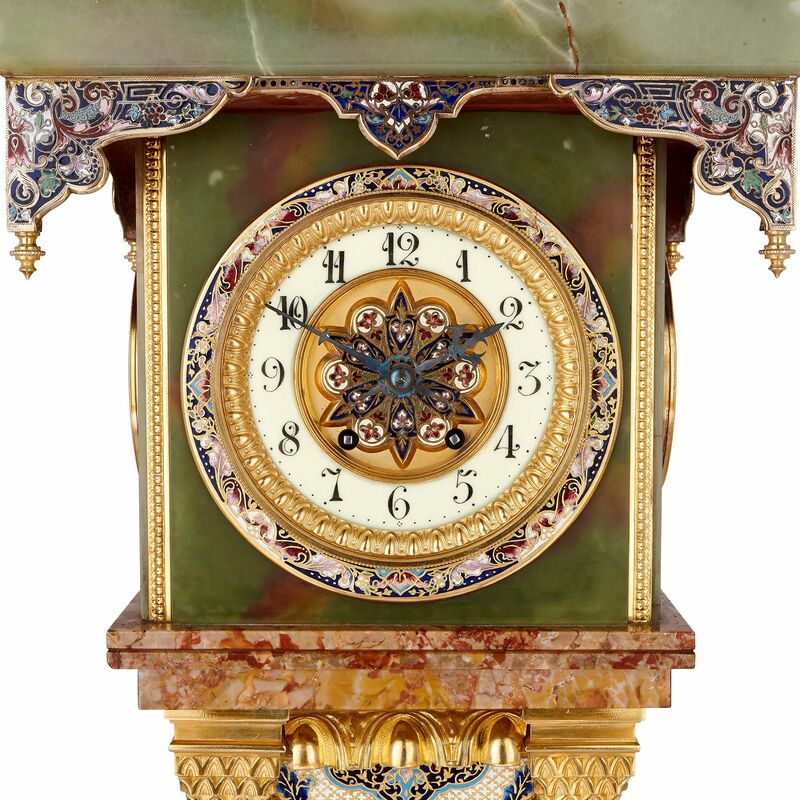 The sides of the clock case are set with circular champlevé enamel and ormolu mounts, which are pierced to allow the chimes of the clock to be heard. 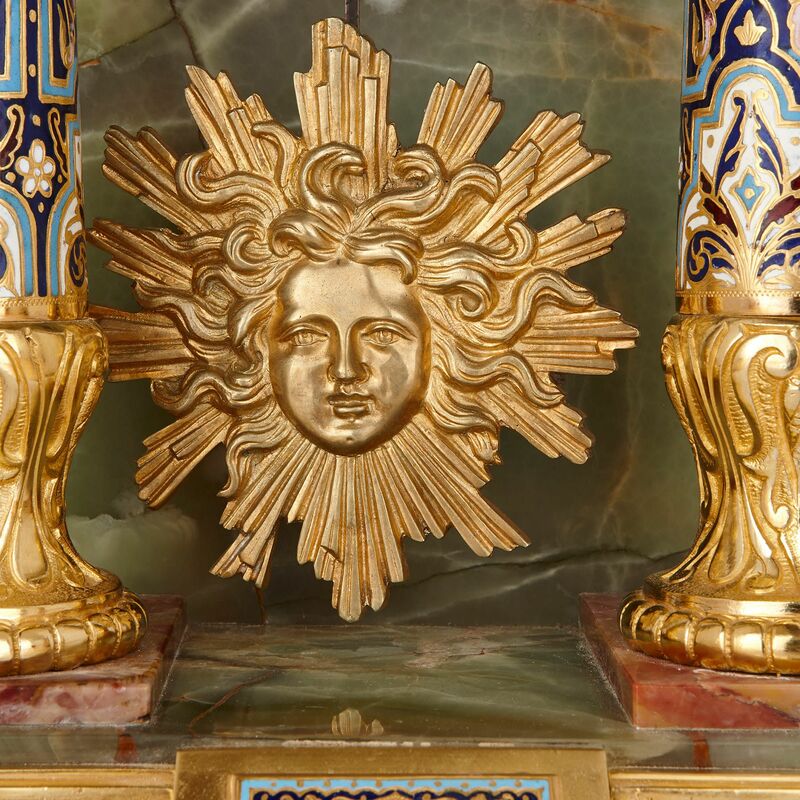 The green onyx block is topped by a slightly wider onyx and red marble slab, with a cusped champlevé enamel fringe, which terminates in ormolu drop-finials.